These are some practices I may use in my team next session this midweek. This time I decide to share my initial idea here. Any feedback would be greatly welcome. Warm-up: [5v5(3v3)]+1 diagonality and central focus. The field consists of two basic shapes, hexagon as the bigger pitch and a smaller circle pitch inside. Two teams compete. Each team consist of five players plus one neutral player as the part of the on-possession side. 3 vs. 3 + 1 neutral in the circle pitch and two blue and two red at the perimeter. A diamond gate in the center as scoring target. The player from the on-possession team must receive inside or dribble through to earn point. On-possession team have two objectives. Earning one point by, either, completing certain number of passes or by receiving a pass in or dribbling through the diamond gate, followed by completed- action (pass to another team-mate or take on an opponent). Defending-team earn a point by winning possession. When winning possession, defensive team turn into the attacking side. When transitioning, both teams have to keep going on. The previous on-possession side must counterpress to make immediate regain avoiding further offensive actions by the opponent. The players in the circle free to press to the perimeter. Players not allowed to park in the diamond. The same player not allowed to receive in the diamond twice in a row. Contact limit applied on neutral and the outside. Played for 5×2 minutes (R’1). Explicitly trains the accuracy of pass (into the diamond gate) under constant pressure. Explicitly asks the defending team to win the ball as soon as possible. 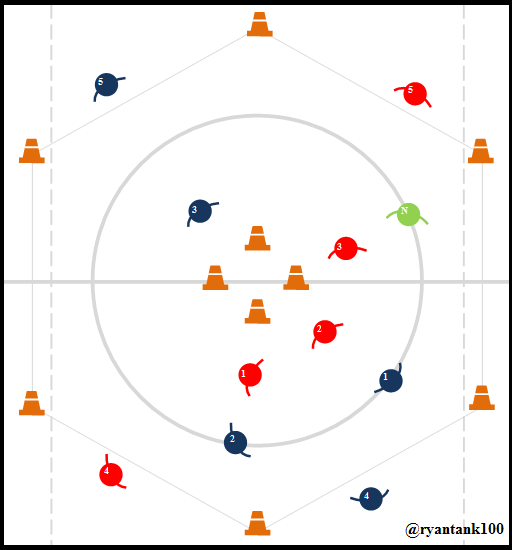 Implicitly trains the on-possession team to focus on progression through the center, generating diagonal access with focus on the center area, and creating “free-player”. 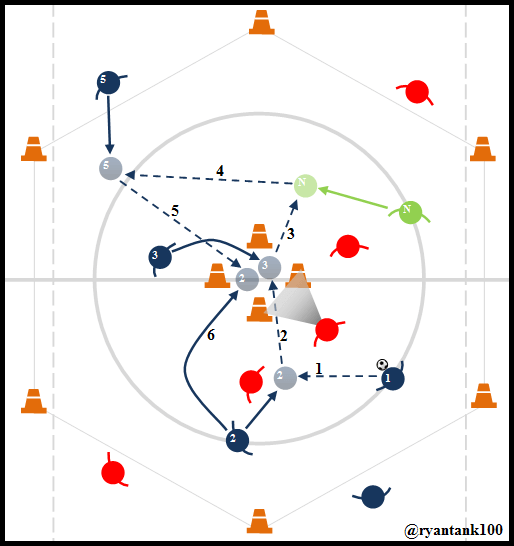 This can be achieved by, for instance, inviting the defending team to collectively-press toward the 1st line and let them press in man-orientated manner as it may create space for the “free-player” behind the press. Players have to be aware of spacing, overload on certain area, fluid off the ball movements, quick passing play, blind-side exploit, etc. After losing possession, the offensive team must coordinate collectively to counter-press and make immediate regain. Implicitly works on how the defending side to find the proper way to press collectively-aggressively to win the ball. 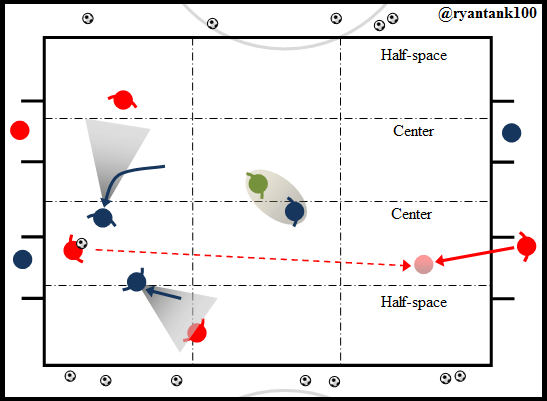 Since they have to avoid the opponent playing through the center, the defending team have to also focus more to the center. They’ll learn how to develop pressing-access; trap; use of cover-shadow; intense backward-press, etc. After winning the ball, the defending team must quickly switch their mentality. If red #1 manages to win the ball from blue #1, what red #3 should do? How does he coordinate with the neutral? Who should move toward the upper circle? They must provide as much clean passing options as possible; is it possible to circulate inside the circle? If not, how do they move to access the nearest outside red? If they play it so, the outside who receives must make a quick on-ball action (remember the contact-rule) so the blue unable to recover immediately. Pressing variation which influences the adaptation level of the on-possession team. Keep an eye on the defending team’s coverage approach. If, say, they keep using man-oriented and dense the 1st line way too much, and in worse case get exploited continuously, explicitly tell them to vary their approach and remind them that contact rule is applied on the neutral. Based on this, they possibly react by pressing using 2-1 shape, for example, and leave the neutral un-marked (pressing trap). This way, as well as the defending team learn “new thing”, the attacking team also forced to adapt to different defensive variation. Contact limit applied with ratio (between the “3” : neutral and outside) 2:1, 3:1, and so on, depending on specific purpose that needs to be achieved. All outside players can freely press in between the circle and hexagon field. More point reward for winning the ball by the defending team. Two minutes rest between-practice before heading into the next one. 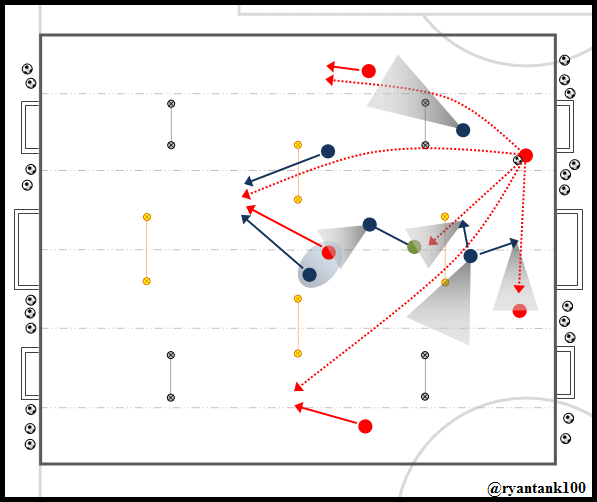 5 against 5 plus 1 neutral as the on-possession player. 8 passing gates as passing target. The orange-gates are 4-4.5 meter wide each and the half-space ones 3 meter wide. Two goals in the center 5.5 meters and 3.5 meters for the rest. Scoring into the big goal earns 2 points and scoring into smaller goal earns 1 point. Passing through one gate earns one point. If a team manage to pass through (at least) one gate in each third and ends-up with a goal into: big goal = 7 points and small goal = 6 point. Before taking a shot on goal, at least, one gate must have been played. Winning possession by the defending team earns two points. Played for 4×3 minutes (R”2). Three gates in early third is to encourage the on-possession side to “make the pitch wide” during build-up. The gates positioning (3-2) from early third to middle third is to encourage more vertical and diagonal-like play with focus to the center area. Two gates in the middle-third area itself to encourage players to create more offensive access from the half-spaces and center. Three gates in the final third can encourage more attacks from the wide area. Thus, can be used to force the defending team to keep shifting horizontally which might destabilize the structural compactness. Secure the central area (the 6 space). Since the center goals and gates are bigger, defending team have to focus more in securing that area from being played by the attacking players. The rules and field profile will encourage the players to find the best way in: (1) playing/using the half-space and generate as much benefits of it. (2) Focusing on the central area, dominate it, and control the match, as the real competition demands it. Depending on the opponent’s press, there’re many offensive-structure can be established by the on-possession team. For instance, 2-1-2-1. This shape creates triangles and diamond in its initial shape without too much presence in the first-line which possibly provides comfortable (pressing) access for the opponent. The pressing team have to also create enough security within their defensive play. A 2-1-2 can be the choice because it gives stability in the center of the pressing-shape itself. It also is an ideal basis for the attacking need, if they win the ball back, because the 2-1-2 creates triangles. The other pressing shape is 3-2-0. The off-possession team defend by applying a zonal press which initially is more suitable to go against 1-3-2 (1-2-1-2). As always, add more players to equal the player number or eliminate the neutral still be the option. These raise the complexity on the attacking team because there is no more numerical superiority. Shot-clock applied to avoid the attacking team take too much possession without making a shot on goal. Passing through the gate as well as shot from the flanks doesn’t earn point. Two minutes of rest before heading to the next game. After two previous intense practices, this shape was used to cool the tension a bit before heading to the last game where we will play with 14 players (hopefully) in a 7v7. In this shape, we’ll play in a field with four vertical lanes (two half-spaces and two centers) and three horizontal lanes (early, middle, and final thirds). The field consists of four vertical and three horizontal lanes. Twelve grids inside the field are the guidance for players to recognize and occupy the desired-space in order to establish the ideal positional-structure, both defensively and offensively. All passing gates are 4-4.5 meters wide. Attacking team are playing from one assigned-gate to the other one. When a gate is played through, players have to keep the possession and try to play to the other-end. A gate must be played before swithing to the other one. Played for 3×3 minutes (R”2). The grids be the media to work on the basis of positional play as well as the defending-aspect. 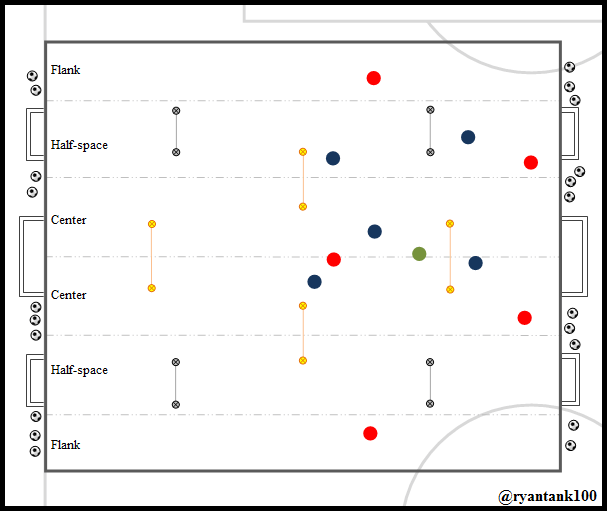 Players from the attacking team can move freely into each zone, but, as ever, they have to pay attention to spacing and connection (width, depth, dynamic, etc), progression, scoring access, and the need of constantly “creating a free-man”. The diagonal positioning between the teammates at either end is intended to encourage more diagonal-like plays. It’s also about to work on how to access the furthest player. The neutral-player explicitly instructed to move between center grids only, as he is the pivot that connects the play. Based on such specific-task, I usually played either #6, #8,or #10 in this role. But, depending on specific need of game model, coaches can adapt it. In contrast to the “making it wide” concept, the defending team need to narrow the space as they need to push the attacking team wide. Since they have to secure as much passing-gates as possible, the defending-team have to make a clean collective shift as well as some intensity adjustment within the structure. On the wide area, for example, the nearest player presses aggresively in highest speed on the opponent’s wide-man and the rest players secure the center and keep an eye on the far-ball space. Instead of two, use three passing-gates at each end. Leave each end-zone with one neutral players and practice in a [4v4]+3 neutral. Take 3-4 minutes of rest before starting the last training game. 6v6 or 7v7 in a 40×60 m2 size. No contact limit, players have to score more goals than the opponent, and off-side rule applied. If possible, will add goal-keeper. The duration is 3×4 minutes (R’2-3). Total approximate time-used, ≥ 68 minutes. This entry was posted in tactic, training and tagged ball-possession, Counterpressing in training, football drill, positional play, small sided game, soccer diagonality, soccer training, soccer verticality, Training. Bookmark the permalink.